Why Cats Lie on Their Backs When They See You | The Fringe | Conspiracy, News, Politics, and Fun Forum! Why Cats Lie on Their Backs When They See You | The Fringe | Conspiracy, News, Politics, and Fun Forum! Why Cats Lie on Their Backs When They See You The-Fringe | Your #1 Source For Conspiracy, News, Politics, and Fun! Meowing is probably something cat learn. We talk to our furry friends all the time, so they too have developed a 'voice' to express themselves to us. We won't spend too much time on the subject of cat's vocalization, but I it is important to briefly mention three or four sounds. A standard 'Meow' is a general signal that a cat wants our attention. Sometimes cats wanting attention will politely 'meow' almost without making any sound at all (though ignoring this may lead to a rapid escalation in sound levels!). A quick 'chirrip' meow is a greeting. The well known 'purr' usually means 'I am content and happy'. But we should remember that a cat will also purr when it is in pain. Cats purr when they are emotional; whether happy or in distress - in some ways purring is also a way to seek attention and aid. 'Hisses' and 'growls' are used when a cat is threatened and challenged. This is the cat's way to warn others to back off - and this is not a good time to approach and pat the cat, even to reassure it. The hiss and growl may not be directed toward you, but the cat may release her aggression by snapping at your hand. While cats have been domesticated pets since the days of Cleopatra, there’s still a lot about them that remains a mystery. Like when they just roll over as you approach them, what’s up with that? Actually, when cats lie on their back and expose their bellies, it’s their way of saying “Hello, human!”! But it's not the only message a cat sends when it shows you its cute furry little belly. BadBrad, Catch, Librarian, MaximalGravity, Mmmmkay_Ultra, Sassy, Sugar_Lips, TheOrderOfChaos, unclelunatic, WNC, Zireael likes this! Cats enjoy pointing the sharp bits at you, luring you in range with a soft furry belly. Don't you believe it. That is a ninja la machine shred factory. Catch, Deplorably Nameless, Librarian, Mmmmkay_Ultra, phxsparks, Sassy, Scuffalufacus, sivil, Sugar_Lips, TheOrderOfChaos, Tolimar, WNC, Zireael likes this! That's how my little buddy sleeps! He's quite talkative as well. Catch, D3VILSR3J3CT, DeadpoolLovesYou, Deplorably Nameless, Sassy, sivil, Sugar_Lips, TheOrderOfChaos, WNC likes this! (02-10-2019, 10:31 PM)PickleSnout Wrote: Cats enjoy pointing the sharp bits at you, luring you in range with a soft furry belly. Absolutely correct. I had a 20 pound Manx cat at one time. He would lure you in and then put the claws on your skin. For him it was a game. With me he would only apply a little pressure with the claws but not break the skin. He hated my girl friend because he was there first. She was an interloper. He would hiss, attack and make her bleed. For entertainment he liked to kill poodles in the neighborhood. I believe he had 4 notches to his credit. And by kill, I mean throat ripped out. DOA doggie. I have sworn off cats. My bestest 4 legged pal is a Aussie Shepherd and Golden retriever mix. A splendid companion. Her name is Allie May. We have a large extended family and some of the youngsters have small children. She loves kids. They all get the licking treatment. Catch, DeadpoolLovesYou, MaximalGravity, PickleSnout, Sassy, Scuffalufacus, sivil, Sugar_Lips, TheOrderOfChaos, Tolimar, Zireael likes this! The fangs of death. Hehehe. Catch, Scuffalufacus, sivil, Sugar_Lips, Zireael likes this! 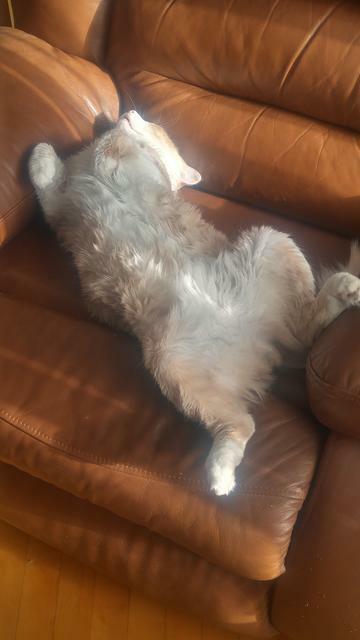 (02-10-2019, 11:00 PM)Zireael Wrote: That's how my little buddy sleeps! sivil, Sugar_Lips, Zireael likes this! Deplorably Nameless, sivil, Zireael likes this! I have a couple of cat pals. Both are nice, no claw stuff, etc. Lily is a big kitty. She likes to have her back and head scratched and tummy rubbed. When she gets excited, she gives little bites (no skin breaking) and makes kitty sounds in between the little bites. She will fetch and retrieve a little rubber ball, just like a dog. When we meet in the house, I get a greeting in a short meow. She's a smart kitty. The other cat, L.G., Is pretty small as cats go. Her favorite thing is watching birds from her window. She knows the word Birdies. If I say Birdies, she jumps to her cat platform and searches for birds through the window, while making tail moves and cackling sounds. She will look back at me and then back to the window with cackling sounds. If I get close to her window and, she's somewhere in the room, she will hop on to her platform and alternate looking at me and looking out the window..wanting to know if I see birdies, and wondering why I haven't alerted her. L.G's pal is one of the small dogs. They touch noses when they meet and he licks her nose. Good kitties.. No fighting and, little interest in each other.